Crane, Mo. 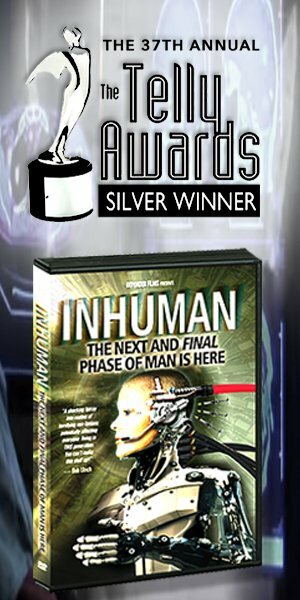 – April 26, 2016 – The Telly Awards has named Defender Films as a Silver winner in the 37th Annual Telly Awards for its documentary film Inhuman: The Next and Final Phase of Man is Here. With over 13,000 entries from all 50 states and numerous countries, this—the Telly’s highest award and recognition for excellence—is truly an honor. Inhuman, the first release from Defender Films, is an investigative documentary from the internationally acclaimed team at SkyWatchTV. Inhuman travels the globe, interviewing internationally renowned experts, to unveil for the first time how breakthroughs in science, technology, and philosophy—including cybernetics, bioengineering, nanotechnology, machine intelligence, and synthetic biology—are poised to create mind-boggling changes to everything we know about Homo sapiens. A fast-growing cultural movement known as Transhumanism intends to use these powerful new fields of science and technology to redesign our minds, our memories, our physiology, our offspring, and even perhaps—as Professor Joel Garreau, Lincoln Professor of Law, claims—our immortal souls. A prestigious judging panel of over 500 accomplished industry professionals judged the competition, upholding the historical standard of excellence that Telly represents. The Silver Council evaluated entries to recognize distinction in creative work – entries do not compete against each other – rather entries are judged against a high standard of merit. Less than 10% of entries are chosen as Winners of the Silver Telly, its highest honor. Below, watch a special extended interview on the syndicated program “It’s Supernatural” discussing the award winning documentary Inhuman. Defender Films is the documentary film division of SkyWatchTV Corp., a new paradigm in Christian broadcasting that investigates prophecy, discoveries, and the supernatural.